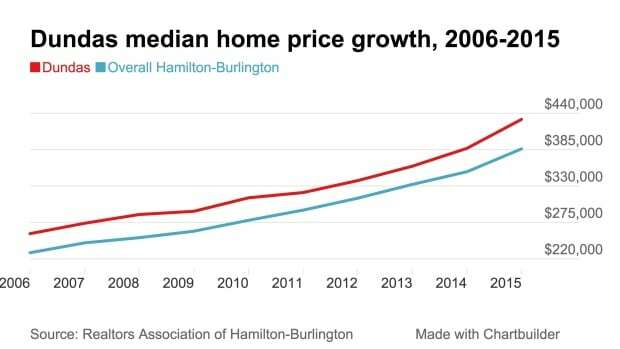 There are numbers behind the hype about hot market conditions in Hamilton's core. 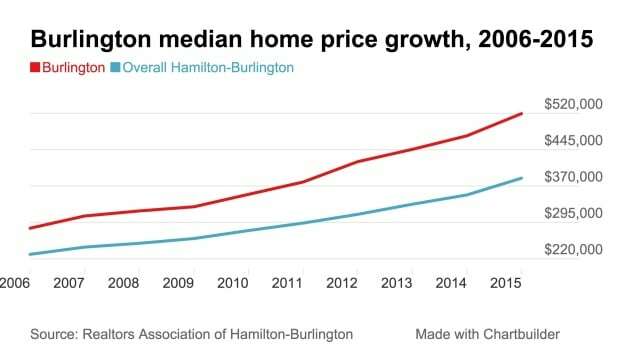 Home prices in central Hamilton have risen by the largest percentage of any sub-region in the Hamilton and Burlington region in the past decade, according to numbers from the Realtors Association of Hamilton-Burlington, which keeps the official stats. That "Hamilton Centre" area in question stretches from James North in the west to Kenilworth in the east, and from the waterfront in the north to the escarpment in the south. 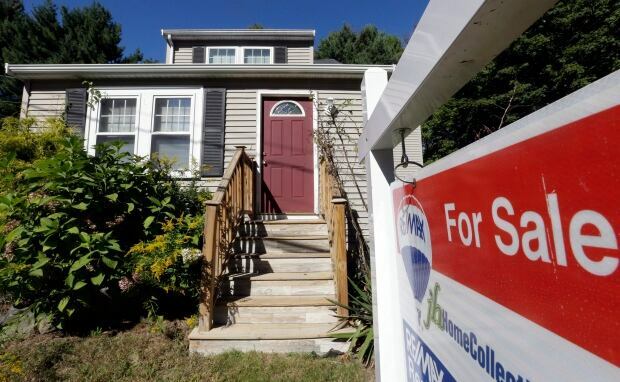 There, the median price for homes sold in 2006 was $120,529. Last year, the median price was $226,989. That's an increase of 88.3 per cent, which was the highest percentage increase of any of the 14 areas the realtors association has divided the Hamilton and Burlington region into. It's still the lowest-priced area in the region, but it narrowed the gap to the next cheapest, Hamilton East. If you swipe or scroll down the page, you can see graphs for each part of the city and see your neighbourhood compares. First, here's a quick look at the neighbourhoods with the biggest growth. What's the price change in my neighbourhood? Check out the activity where you live in the graphs below. Note: The scale will be different from graph to graph, depending what price range the median in your area is in. 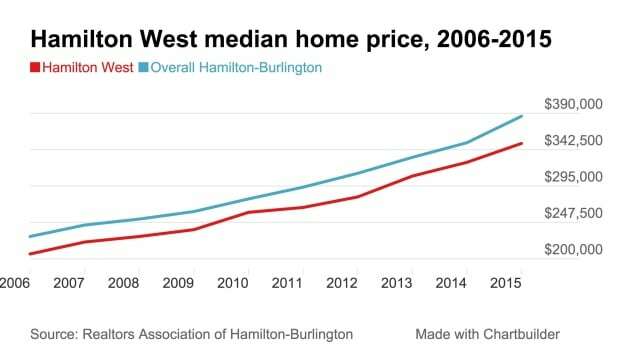 Hamilton West is between the 403 and James Street North, the waterfront and the escarpment. Its median price was $350,648 in 2015, up 70 per cent from 2006. Hamilton East stretches east from Kenilworth Ave. and includes the beach strip, McQuesten, Glenview East and Red Hill. Its median price was $240,418 in 2015, up 53.6 per cent from 2006. Hamilton Mountain stretches from Highway 6 to Pritchard Road and from the brow to Twenty Road. 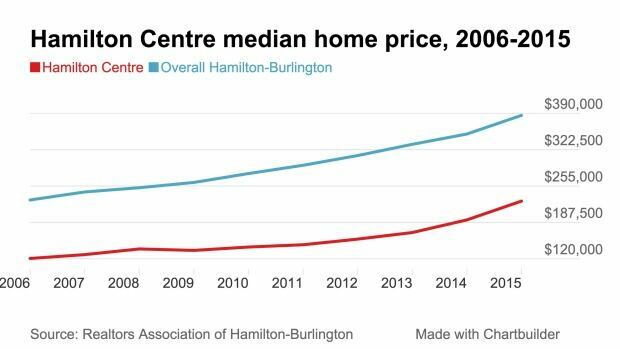 Its median price was $329,024, up 59.8 per cent from 2006. 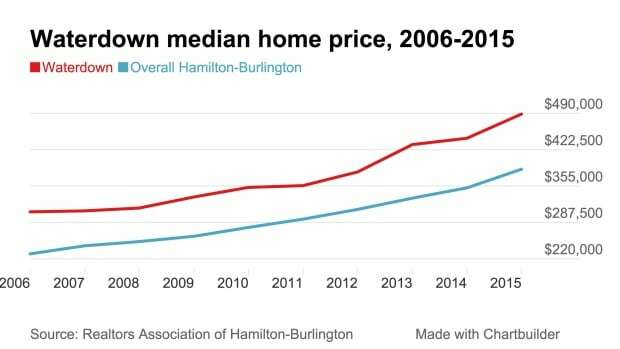 Ancaster's median home price was $530,095 in 2015, up 64 per cent from 2006. 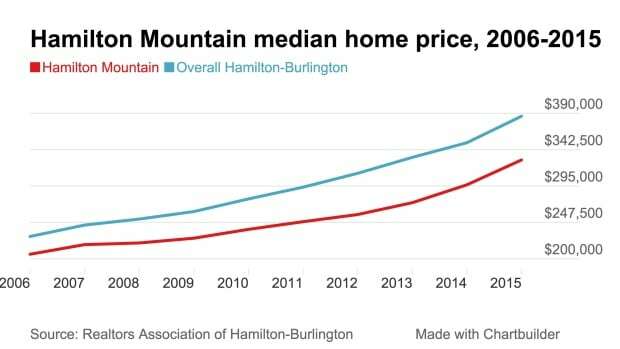 Burlington's median home price was $519,314 in 2015, up 83.5 per cent from 2006. 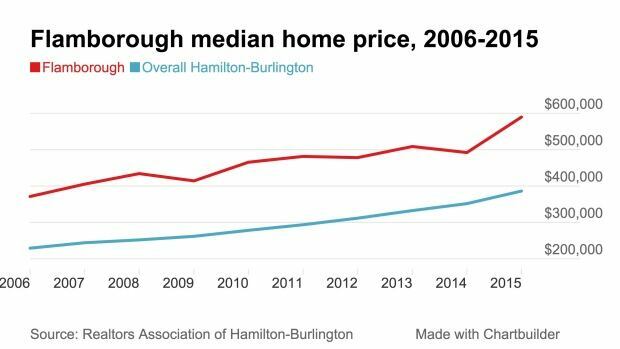 Dundas's median price was $430,780 in 2015, up 67 per cent from 2006. Flamborough's median price was $589,657 in 2015, up 59 per cent since 2006. 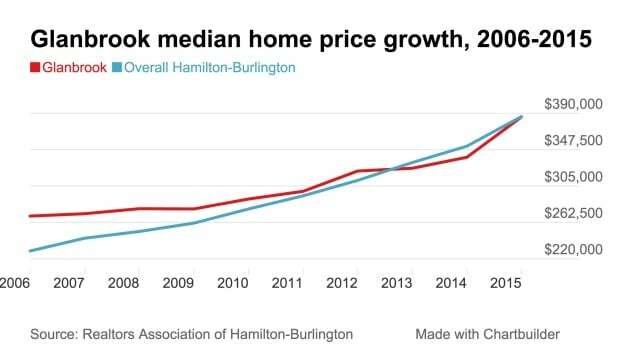 Glanbrook's median home price was $385,766 in 2015, up 43 per cent from 2006. 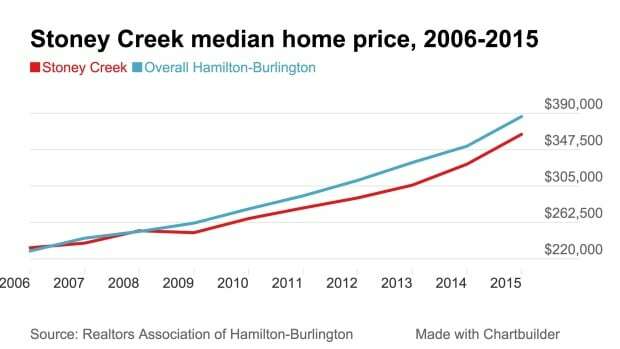 Stoney Creek's median home price was $365,402 in 2015, up 57 per cent from 2006. 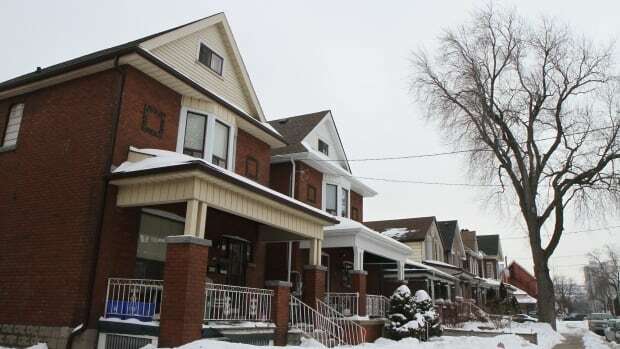 Waterdown's median home price was $488,581 in 2015, up 59 per cent from 2006.